UN Middle East envoy says Gaza must be saved from disaster, calls to transfer power to Abbas. UN Middle East envoy Nickolay Mladenov warned on Tuesday that Hamas-controlled Gaza was on the verge of "full collapse", AFP reported. According to Mladenov, a key to saving Gaza from disaster was restoring the government of Palestinian Authority (PA) chairman Mahmoud Abbas to power there, a decade after it was forced out by Hamas in a bloody coup. "Without that Gaza risks exploding in our face again, this time in a far more deadly and violent manner than in the past," Mladenov was quoted as having said at the annual conference of Israel's Institute for National Security Studies in Tel Aviv. Abbas's Fatah and Hamas signed a reconciliation deal last October, under which the PA was to have resumed full control of Gaza by December 1. That deadline was initially put back by 10 days and had later reportedly hit “obstacles”. Sharp disagreements remain between the sides, particularly over the fate of public employees in Gaza and security control of the enclave. Abbas has demanded that the armed militias in Gaza disarm as part of the implementation of the agreement, but Hamas has categorically rejected this demand. "I often say publicly, in (UN) Security Council briefings and in other formats, that we are in the midst of a major humanitarian crisis," Mladenov said Tuesday, according to AFP. "Let me be very clear today here, that we're well beyond that," he added. "We're on the verge of a total systems failure in Gaza, with a full collapse of the economy, with social services, political, humanitarian and security implications stemming from that." 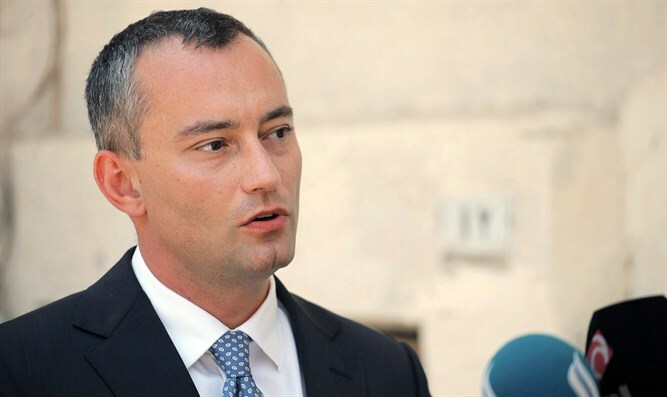 Mladenov said he would raise those concerns in Brussels on Wednesday at a meeting of the Ad Hoc Liaison Committee, which coordinates international donor support for Palestinian Arabs. He said the meeting would be at a high level with representatives of the Israelis, Palestinians and "a number" of Arab foreign ministers attending. Rami Hamdallah, the head of the PA government in Ramallah, will take part in the meeting. "One of our key messages must really be: what can we actually do to create and preserve hope for the people of Gaza, in order to address both the militant aspect of it and the humanitarian aspect?" Mladenov said. Besides the ongoing conflict between Fatah and Hamas, Gaza has also seen its Rafah border with Egypt closed for the most part since October of 2014, when a lethal terrorist attack took place in the Sinai Peninsula. Egypt blames Hamas terrorists for providing the weapons for the lethal 2014 attack, which killed 30 soldiers, through one of its smuggling tunnels under the border to Sinai. Hamas denies the allegations. Egypt opens the crossing for short periods of time and mostly for the passage of humanitarian cases. Israel, in contrast, continues to regularly allow humanitarian aid and construction materials into Gaza, even though its terrorist rulers continue to attack southern Israel with rockets and openly threaten to destroy the Jewish state. Despite the constant aid entering Gaza, its Hamas terrorist rulers claim the enclave is under an “Israeli siege”.